Please note the change of arrangements this year. Recent utilities work has had a significant impact on the area where the Christmas Tree is located. The safety of all involved has to be a priority and the current condition of the traditional cross-roads venue poses too high a risk. Subsequently, a decision has been made to hold the whole event at the school. The council has been informed and is in agreement with this decision. 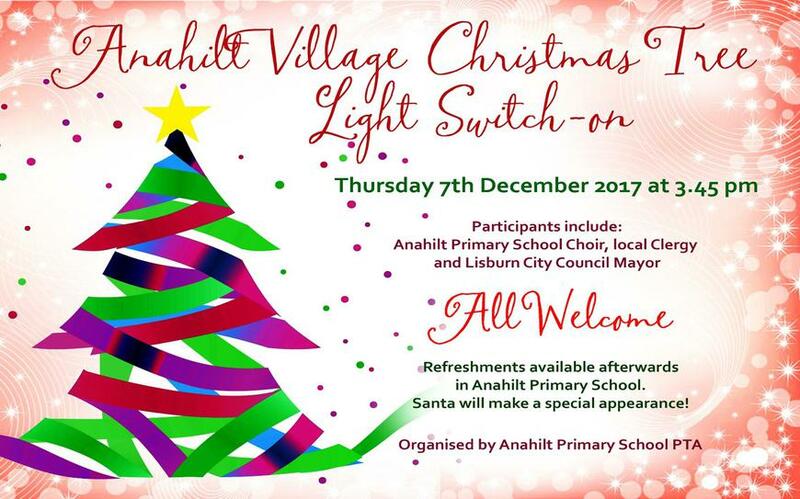 The new arrangements will be as follows: Anahilt PS Choir will gather outside the front of the school at 3.45pm (weather permitting) to lead the carol singing and they will be joined by members of the local clergy and the Mayor of Lisburn. Refreshments will then be served in the assembly hall and children will have an opportunity to see Santa.